Patients with some types of brain tumour could avoid long stays in hospital if trusts adopted an urgent care pathway, the latest report from the Getting It Right First Time (GIRFT) programme has found. GIRFT’s review of cranial neurosurgery services in England found that patients with a malignant tumour admitted for emergency surgery as soon as they are referred can lead to many patients waiting several days in hospital before their operation, due to more urgent cases taking priority. Instead, consultant neurosurgeon Nick Phillips, who conducted the review, recommends trusts provide an urgent care pathway with elective admission on the scheduled day of surgery within a week of referral. Patients admitted electively rather than via the emergency route benefit from a clear schedule and spend an average of seven days fewer in hospital. The report also highlights University Hospital Southampton’s policy of managing glioma tumour surgery for the majority of patients with the expectation that, wherever possible, patients will stay in hospital for one night only after surgery. This has helped the trust achieve an average length of stay for elective glioma patients of just two days against the national average of 6.4 days. Around 75,000 patients receive neurosurgery on the NHS each year. Some are emergencies such as traumatic brain injuries and blood clot on the brain. Other procedures, such as surgical removal of a malignant tumour, can be conducted urgently within a few days of diagnosis; while others such as treatments for chronic pain due to trigeminal neuralgia can be planned as elective procedures. 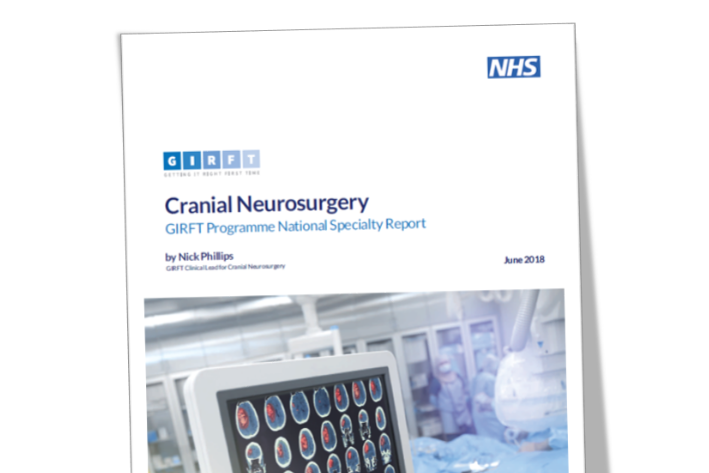 The GIRFT cranial neurosurgery report focuses on the pathways of patients and changes that will help avoid bottlenecks and free up hospital beds. It highlights how cranial neurosurgery providers could deliver a better service to patients by treating them more promptly and minimising cancellations and delays. Author Nick Phillips identifies a total of 15 recommendations to support a more productive cranial neurosurgery service, enabling more patients to be seen and treated sooner. There are substantial opportunities to improve patient experience and outcomes, and deliver cost efficiencies of up to £16.4m through smarter procurement, avoiding unnecessary admissions and using critical care only when clinically required. A streamlined admissions-to-surgery process (admitting more elective patients on the same-day as surgery rather than in advance) helping reduce length of stay. This could save up to 3,625 bed days a year, equivalent to a saving of £1.4m. Increasing the number of minimally invasive day-surgery procedures such as stereotactic radio surgery, endovascular surgery and trigeminal thermocoagulation, thereby reducing the requirement for overnight admissions and reducing pressure on beds, which could save up to 245 bed days and around £95,000. Reducing the average length of stay in critical care for cranial trauma patients who undergo surgery to five nights or fewer could save 2,030 critical care days at a cost of £1.9m and free up critical care beds for other patients. Reserving at least one operating theatre per unit for emergency (non-elective) cases to reduce postponement and cancellation rates for elective procedures could save up to 1,095 spells in hospital per year equivalent to £1m – and deliver a major improvement in patient experience. Increasing elective admissions for glioma tumour surgery could save up to £1.18m based on bed day reductions. Mr Phillip’s recommendations were developed after visiting and reviewing data from the 24 trusts in England that conduct cranial neurosurgery procedures. The recommendations have also been fully endorsed by the Society of British Neurological Surgeons (SBNS). The recommendations will be implemented by GIRFT’s teams working with NHS Improvement and alongside bodies such as NHS England, NHS RightCare, the Society of British Neurosurgeons (SBNS), and the Royal College of Surgeons, as well as directly with trusts, Clinical Commissioning Groups and Sustainability and Transformation Partnerships.